Join this 10 minute live Q&A with Splunk cloud migration experts as they discuss how organisations are cutting through the fog to gain visibility into their cloud environments for monitoring usage, security, compliance and keeping control of costs. your customers at risk. What do you do next? Officer Elizabeth Davies and Splunk’s Security Ninja Matthias Maier. The Cisco Computer Security Incident Response Team (CSIRT) is a global team of information security professionals responsible for the 24/7 monitoring, investigation and incident response at one of the world’s largest and leading technology companies. 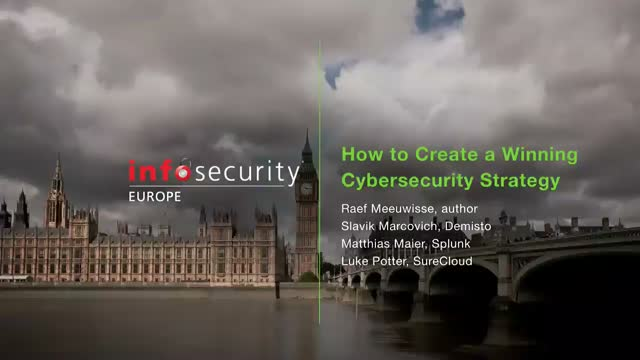 Learn how Imran Islam, leader of Cisco’s EMEA/APAC CSIRT team relies on Splunk to help his team drive best practices in threat assessment, mitigation planning, incident detection and response, incident trend analysis, and the development of future security architecture. - Learn how to introduce consistency into your security team for approaching and solving security problems. Cyberattacks are top of mind for organizations across the globe. In fact, 62 percent of firms are being attacked at least weekly and 145 percent are experiencing a rise in the number of security threats. But do organizations have the processes in place to investigate and effectively respond to these incidents? IDC recently surveyed security decision makers at 600 organizations to understand the state of security operations today. Description : It's no longer a question whether an organization will be breached -- it's a matter of when. According to Gartner, organizations are failing at early breach detection, with fewer than 20% of breaches detected internally. * The time to detect a compromise can takes days, or even months. Join this webinar to hear Splunk and Gartner discuss the strategic role of SIEM as a centralized solution and why organizations need to move from prevention only solutions to detection, response and remediation. From national health agencies to public transportation infrastructure, the recent WannaCry ransomware attack has upended organizations around the world. Although a security issue, the fast propagation and business-impacting nature of the attack shows that ransomware is a greater concern that affects all of IT. How can you better prepare and respond to such threats? Watch this ondemand webinar to learn how to apply a broader analytical approach and data-driven techniques to quickly pinpoint the source of an attack and determine the appropriate remediation steps. Illumina, a leader in genetic sequencing, needed a security solution to provide visibility into all its data and to accelerate the detection of advanced malware, and investigate and hunt threats. Splunk Enterprise Security (ES) is an analytics-driven SIEM that powers successful security operations teams. But did you know it is actually made up of distinct frameworks that can each be leveraged independently to meet specific security use cases? Ransomware has moved from a nuisance targeting consumers to a serious threat to businesses and government agencies. In this session you will learn more about what ransomware is and how it works, followed by a live Splunk demonstration with data from a Windows ransomware infection. Faced with a complex, heterogeneous IT infrastructure and a ‘Cloud First’ instruction from the board, Nick Bleech, Head of Information Security at building supplies giant Travis Perkins, used Splunk Enterprise Security running on Splunk Cloud to deliver enhanced security for 27,000 employees. Splunk allowed Travis Perkins to provide real-time security monitoring, faster incident resolution and improved data governance while delivering demonstrable business value to the board.